Starting with a look at the world economy, Professor Kotler suggested that growth rates will be 2–3% on average, higher in the Far East and lower in the West, based on World Bank estimates. Can we do anything about this? Yes, we can, according to Kotler. The answer is found in innovation. But, innovation is unnatural for a company, according to Kotler. The reason is that you always strive for efficiency through processes that are aiming at steady state operations. Innovation will disrupt the steady state which means you have to make an effort and be aware of it. A digital method for innovation used by some companies is crowdsourcing. Why not let creative people wherever they are help you with new ideas? Kotler also suggests that you continuously scan for new technology within robotics, artificial intelligence, neuroscience, IT, biotechnology, etc. Find ways to apply this to your products and ways of working. In parallel with innovations, you have to work with your brand and sales & marketing. The brand gives you the permission to be in the market and marketing creates the reason for someone to buy. What about the super sports car manufacturer Koenigsegg? With a price tag of over $3 million, you would expect a lot of innovations in the car. And, you get it. The car is the brand. The entire company is based upon innovative ideas and the capability to turn them into reality. You could say, their business is innovation. Or, as Christian von Koenigsegg puts it; ‘The internet is the global brain. But, don’t expect someone to know something about something no one has done before’. It all boils down to people and culture. Creativity, guts and perseverance. The meaning of digital transformation is simple. Either you use new digital technology to create new business (e.g. Uber, Airbnb), or you use the new technology to improve your existing business (e.g. marketing automation or the use of artificial intelligence in helpdesks). According to a recent report from Boston Consulting Group, one way to mitigate the expected lower growth rate in Europe is to let digital frontrunner countries in Europe lead the way in digitising Europe. The transformation would create growth and new job opportunities on national, company, and individual levels. Even here, the underlying assumption is that innovative and digital technology is the future. So, what did Professor Kotler say about digital transformation and all the other trending buzzwords? Not much actually. He did not have to since his message was loud and clear. Innovation is the driver of any economy even in times of digital transformation. Of course, he touched upon a few conclusions like that we need fewer managers in the information society and that lean marketing is here to stay. 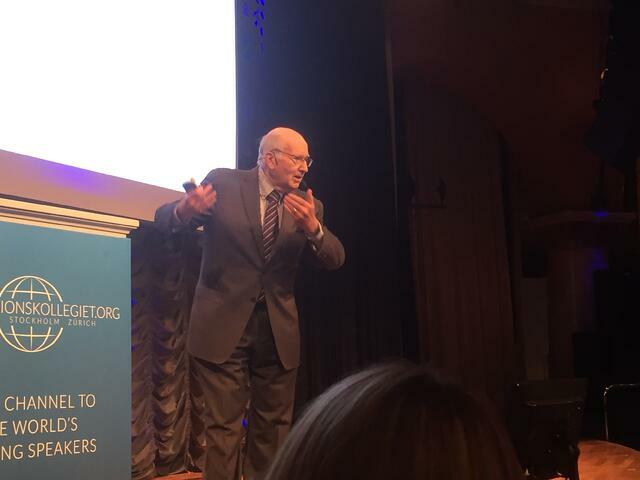 But, Professor Kotler kindly reminded us all that the role of marketing is to give a product purpose and meaning. And, we cannot do that unless we start with understanding who the customer actually is. It was true then, it is true now. Sometimes we tend to forget. Keeping all this in mind, the formula for success seems simple; understand your customer, look for innovations, be creative and adapt innovations to your business, and have guts and perseverance while doing it.